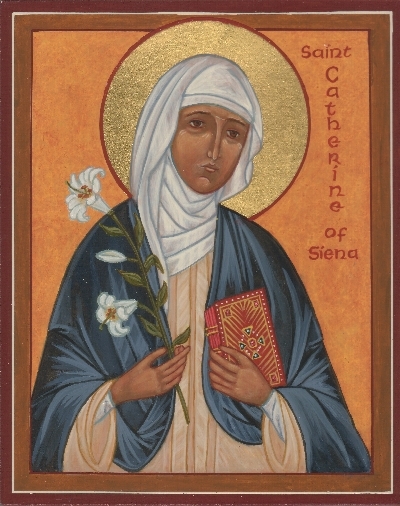 Saint Catherine of Siena was quite the woman of the Middle Ages! Living in the Fourteenth Century, she advised popes and politicians. She was named a Doctor of the Church, being one of only three women to share that title along with St. Theresa of Avila and St. Therese of Lisieux. Above all, she was humble before our Lord and loved Him with all her heart and soul. I have a new appreciation for St. Catherine after visiting her “cell” — the small room in the home where she lived — in Siena, Italy, and seeing the church, the Basilica of St. Dominic, where she attended Mass. The Church celebrates St. Catherine of Siena’s Feast day on April 29th. With this in mind, here are ideas of activities you could do with your children to celebrate this great saint. Since St. Catherine of Siena is the Patron Saint of Italy (along with St. Francis of Assisi), you can make an Italian dinner on her feast day as a treat. We are going to have my family’s favorite, lasagna, that night along with Italian bread and salad. Cannolis for dessert can be a sweet addition. Here is a recipe for cannolis. Glue the image to white card stock and have your children decorate it with glitter, stickers, crosses, etc. To the right is a finished example of what my children did. After their work is displayed for St. Catherine’s Feast Day, it is put in a page protector in our Liturgical Calendar Notebooks (more on these in a future post!) This way the children can go back and look at it easily in the future, and Mom and Dad have this and other activities organized together in one place. This book is a great read aloud for ages 6 and up. There are many different saints featured in here including St. Catherine of Siena. Amy Welborn does an excellent job of teaching us about St. Catherine in this book. This is a beautiful story by Mary Fabyan Windeatt for children age 10 and up. Enjoy! This book by Dianne Ahern is in a series of fictional books called Adventures with Sister Philomena, Special Agent to the Pope. Written for children ages 10 and up, each book is a mystery to be solved and this one happens to be about a letter found that might have been written by St. Catherine of Siena. It is exciting and educational all at the same time! Louis De Wohl writes a spectacular story of the life of this great saint! This book is for high schoolers and up. If St. Catherine is a saint you are interested in knowing more about, this is a must read book! How blessed we are as Catholics to have incredible role models like St. Catherine of Siena to inspire us and help us to live out our faith daily in love and humility. God can use us all to change the world if we are listening and say yes to Him … just as St. Catherine did her whole life. Great ideas, as always, Margaret! So many ideas come to mind because of the ones you share!! Thank you, thank you, thank you!